"...& then there's an ACURA Oil Change"
Superior materials and advanced technology combine to make the ultimate oil filter for your Acura. For example, take apart an Acura oil filter and you'll find 60% more paper, based on surface area, than the leading competitive oil filters. This variable density filter paper is responsible for trapping contaminants and keeping your oil clean. Clean Oil = Happy Engine! P-RING SEAL DESIGN A round seal, not flat, provides solid contact between the filter and engine. This is what keeps your oil inside the filter and prevents it from leaking all over your garage! ANTI-DRAINBACK VALVE This prevents dirty oil from draining out of the filter and back into your engine after the engine is shut-off. Acura uses Silicone material for optimum performance. Unlike many other oil filters, Acura Genuine Oil Filters are designed specifically for Acura vehicles, to provide maximum protection and improved engine life. Acura Dealers Replace the CRUSH WASHER. What is a Crush Washer and why is it SO important to your Acura? The crush washer is a gasket that fits between your oil pan and the drain plug. It is only supposed to be used one time, and should be discarded during each oil change and replaced with a new one. 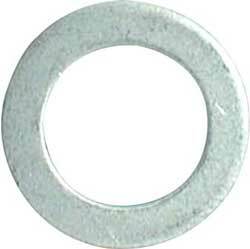 When a new washer is installed and the drain plug is tightened, this washer "crushes" to form a very tight seal, this prevents motor oil leaks without overstressing the oil pan threads. Oil changers who are not aware of its importance may think it's OK to re-use this washer. Since it has already been crushed, it will not collapse any further. As a result, the installer may over-tighten the drain plug to get a tight fit. This can eventually lead to stripped threads in the oil pan--a VERY expensive repair. --Acura dealers know your vehicle inside and out, and can provide competent, efficient service. --Acura technicians check the engine block to make sure the O-ring from the old filter is not stuck to it. If it is, the technician scrapes it off thoroughly and wipes the surface clean. If a new oil filter is installed over the old O-ring, the filter could come loose over time. When installing a new Acura Oil Filter, Acura technicians torque it to the proper specifications. To keep the new O-ring from shearing when torquing the filter, they apply a lubricant, such as engine oil, to it. Before returning your Acura, many Acura technicians spray a cleaner onto the oil pan near the drain plug to remove any excess oil so you don't have oil on your driveway or garage. They also know to clean the crevices in the undercarriage where oil can pool while draining, only to drip later on. 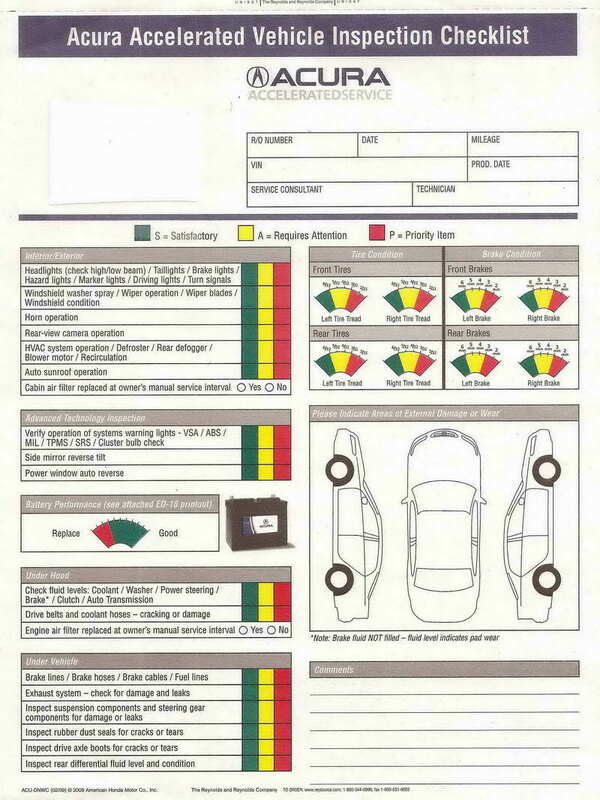 --Most Acura dealers complete a thorough Multi-Point Inspection with every service. Click on the image (right) to see everything they inspect! Acura recommends using Genuine Acura Oil for your vehicle. It meets the Starburst performance requirements (This symbol indicates that the oil meets the latest performance requirements set by the automotive and oil industries. Oil bearing the Starburst will provide superior performance in the areas of deposit and sludge protection, wear protection, and oil life), and is also subjected to a series of Acura-specific tests to guarantee optimum performance and compatibility with your Acura vehicle. It has just the right amounts of detergent and lubricants prescribed by our engineers. To learn more, click on the picture above. 1st OIL CHANGE ON MY NEW ACURA Your Acura engine was delivered with an oil that is specially formulated for new engines that have not yet developed their "natural" wear patterns and may contain minute particles from the manufacturing process. 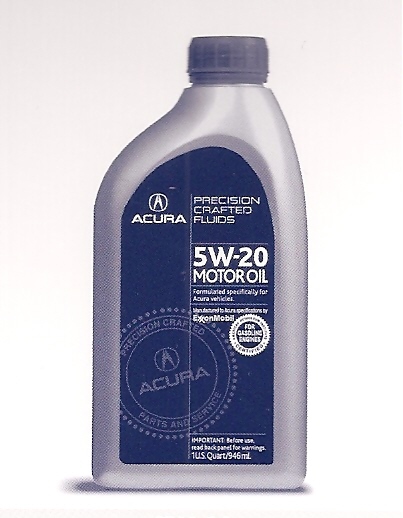 Acura strongly recommends this special oil be left in the engine long enough for these wear patterns to develop, usually until the first maintenance interval specified in your Owner's Manual, based on your specific driving conditions. Most Acura dealers check your tires, batteries and fluid levels. Batteries never die when it's convenient! Your Acura dealer can do a complimentary battery test with a special diagnostic tool that detects when a battery is approaching the end of its life, so you can avoid ever getting in a no-start situation. With this simple test you'll know whether your battery is good, bad or better off replaced. Acura batteries carry a 100 month limited warranty & 3 years free replacement. Re-Tire at Acura! High performance vehicles are equipped with high performance tires. Most Acura Dealers will check your tires and keep you informed about when you need new ones. Maintain your Acura's Precision Crafted Performance with the name, reputation and quality of original equipment factory spec tires. Acura dealers know exactly which tires your Acura needs--if the wrong tires are installed, noise and vibration could result.